Thanks for trusting Cooking Hacks. Although you can read our full: Terms & Conditions, this page explains most frequently asked questions about orders. For technical questions ask in our forum. It is the fastest way for getting a response. 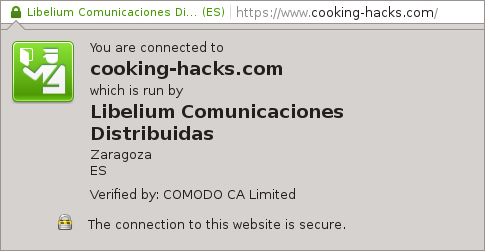 The entire site works now with SSL certificates signed by a third party Official Security Authority. All the transactions are encrypted, signed and 100% secure. All the orders are prepared after the payment reception. Please Note: Wire transfer payments may take 1-5 business days to clear depending on your location. We will not ship your order until your payment is verified by our bank. A record of the transaction from your bank is not sufficient to release an order. When you choose Paypal Express Checkout we ask Paypal to send us your billing address. If you don't want PayPal to send it to us, contact us and we will ask PayPal to stop sharing this information with us. Check the credit limit (daily, per transaction...) with your bank. Check the security of your card (international / online transactions, security code entered correctly...). Verify that you have charged the card (in case of pre-paid cards). Verify your Credit Card number, Expiry date and CVV have been entered correctly. We try to find the best and cost effective shipment way for you. Due to this and the fact that we serve orders worldwide, you have different shipping ways depending on your location. All products are enclosed in a good package in order to avoid hits and we take care with electronic components, putting them into anti-static bags, offering a good service to our customers. If you need to receive an order within a lower period of time than above mentioned, please, contact us for arranging an extrordinary shipping way. Postal service may take 3~4 weeks. Actual shipping costs are calculated during checkout. For an estimate before checkout, please add the items you intend to order to your cart, then click "calculate shipping" from the Shopping Cart page. This will provide a list of estimates for the shipping methods available to your selected destination. Please Note: the shipping costs does not include the duties and taxes in the destination country expenses since they vary with a number of parameters. In case of exports, the order will be shipped with a final invoice for customs so it will contain the same amount that was paid, not less. If the customer refuses to pay these extra charges, the return shipping and any additional fees will be taken out of the cost of the order, with any remaining funds being refunded to the customer. We usually prepare orders from 9am – 11am, we can not make guarantee of same-day shipping for orders placed after 11am. In order to improve the quality of the products to our customers, we have been looking for a strong and reliable box to keep our products safer. After trying several models we decided to design our own one, stronger and with a nice feel to touch that corresponds to the quality of the products.In the external sides, you will see our logo and main red colour that identifies our site. The box comes with an Authenticity Hologram to ensure a product has the Quality of Libelium Official Designs. Inside, you will find some foams to prevent our products from hits and external agents (dust). This hologram will be our Quality Certification to ensure that the product you are buying has been tested and manufactured under the quality of Libelium Products. For us, it is very important to offer the best quality in our products and we want to show it, not only related to the products but in the development of them. A quality given from a team of engineers in Libelium who design the PCB, schematics and documentation of each product released by us. Please call: +34 976547492 with your order number at least one hour before you intend to arrive at our office. You will be notified when your order is ready to be picked up in our location. Orders are available for pickup between 10am and 3pm, Monday through Friday. This method will be available only in Spain for order with Subtotal above 150€. We do our best for providing high quality products. If you have any problem with the items shipped, contact us for an RMA number. Our technical service will contact you to determine whether the merchandise must be replaced or repaired. Important: Before requesting for the RMA, read first the document: Terms & Conditions. In Stock. The product is available in our warehouse. You can place the order and you will receive it according to the shipping method. On Demand. On Demand products are items that we bring to our customers through an order. We have more than 4000 On Demand products to complete any order in our shop!!. So place a normal order and we will ask for them to our suppliers, and we will ship them to you in only one shipment to save costs. The terms are from 1 to 3 weeks. When the order is complete, we will ship it. Back Order. Currently, there is no stock, but we will receive it soon. You can buy it and we will ship the order as soon as it comes back available (normally from 1 to 3 weeks). Orders that include an On Demand or Back Order item will be shipped when they are available again in one shipment. This means the order will take from 1 to 3 weeks to be shipped once the order is placed. You will be notified when adding a backorder product in the cart. If you want to receive first the items in-stock, please, place two different orders separating the in-stock and On Demand or Back Order items. Retired. This product is only available for search (tutorials, schematics...). They can not be purchased. Pending: this indicates we've received your order, but we are waiting for the payment. Order received correctly: we are preparing your order and you will be notified when your package is shipped. If you have bought On Demand or Back Order products, this status will be kept until receiving the goods and being ready to be shipped. Canceled: your order has been canceled. If you have any questions, please email us at: orders [@] cooking-hacks.com, and we'll explain the state of your order. Please Note: It may not be possible to cancel your order once it is submitted. If you need to cancel an order, and that order is still in the Pending status, please call us immediately at: +34976547492. We are open Monday through Friday, 9am to 3pm, CET. If we are closed when you call, you can send an email, but due to normal variations in shipping speed, your order may have moved out of Pending by the time we get the message. If that is the case, it will not be possible to cancel your order, despite your timely notification of cancellation. To avoid any trouble, please make sure you want everything in your cart before clicking 'Submit'.